Millennials spend 30% of their media time (5 hours/day) engaged with user-generated content (UGC). Coincidently, this is the same generation that drives AirBnB’s success in the sharing economy. Triangulate that with Instagram’s user demographics – 55% of online adults between ages 18 to 29 – and we can see why AirBnB actively deploys user-generated content in its digital and social media marketing efforts. 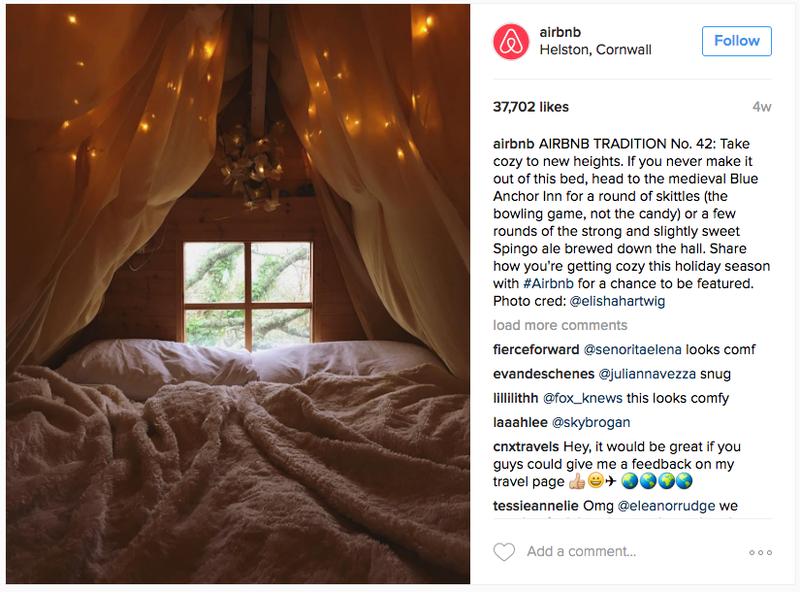 77% of content posted by AirBnb in Q4 of 2016 on Instagram was user-generated content and the results are not surprising – 80% of AirBnB’s Instagram engagement is driven by user generated content. In less than a decade since its launch, AirBnB marketing has taken over the travel and hospitality industry, becoming the third-largest online accommodation seller worldwide, according to Phocuswright. AirBnB’s secret to success is staying personal and understanding its target audience, which helps them to build its loyal community. The company often talks about the importance of social media in building its community. – James McClure, ‎GM Northern Europe at Airbnb. Earned content is an indispensable tool in a marketer’s arsenal to build and grow their social media communities, mainly because it provides a rich new storytelling opportunity for marketers to tell their brand story and build a more trusting relationship with the consumer. According to various studies, over half (51%) of Americans trust user-generated content more than other information on a company website and claim that it influences what they buy and where they buy it from. Other research adds that 43% of people are more likely to purchase a new product when they have learned about it through social channels or from friends and family. Using UGC in its content strategy has not only helped AirBnB drive engagement with its audience, but it has also helped to grow its Instagram community by over 13%. This might look like a small increase, but with the huge base AirBnB already has, it translates to over 172K followers added in the data period. Regramming UGC on Instagram gives AirBnB a huge body of excellent pictures from the world over to share with its audience, pictures that speak to the brand’s values and showcase the unique homes, experiences, and places around the world. This does not only encourage followers to explore new places to stay, it also motivates them to create content worthy of being shared with others and to interact with Airbnb as a brand. 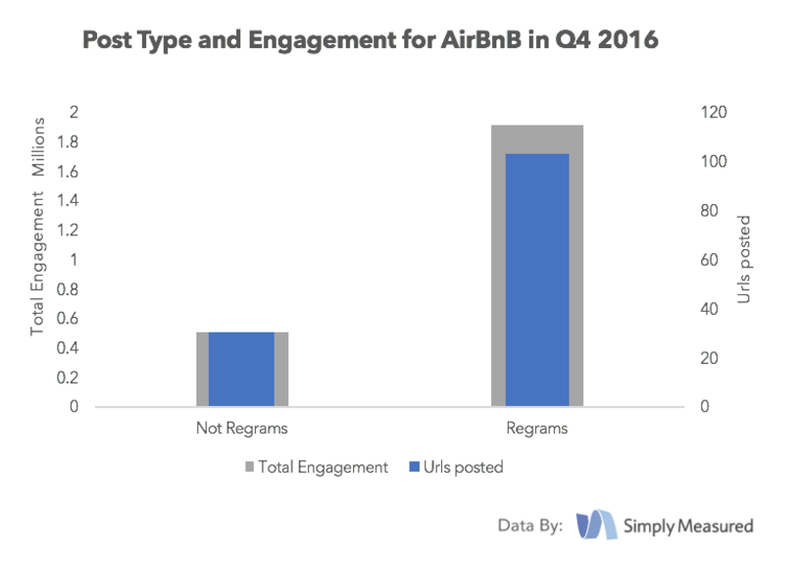 In Q4 2016, AirBnB mainly asked for its users permission to regram their pictures. In the past, they have run contests to encourage photo submissions from their audience. Five of the top ten Instagram posts by AirBnB in Q4 2016 were regrams, including the second most engaging post shown below. When it comes to creating content for your marketing, it is now more important than ever to collaborate with your audience to improve the quality of the earned content, and to create opportunities for conversations. Such measures can help build relationships and inspire trust, which go a long way in terms of strengthening partnerships between brand and their Instagram communities. Tripti Shrivastava is a Digital Marketing Manager at Simply Measured. She loves food, music, movies, and long walks.